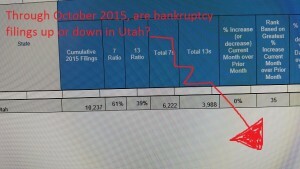 Through October 2015, are bankruptcy filings going up or down in Utah? The American Bankruptcy Institute compiles a list of bankruptcy filings per month, per state. 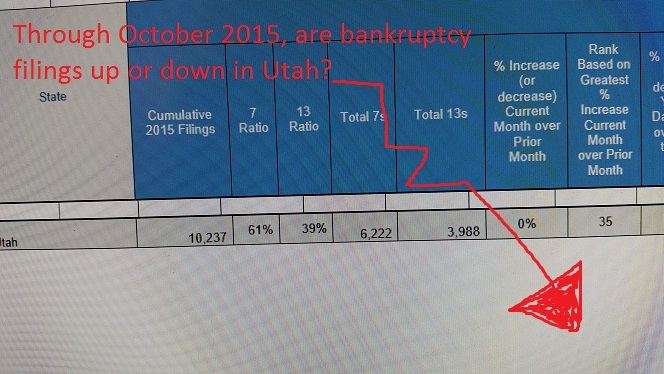 I was reading their pages today (because that’s the kind of exciting life bankruptcy attorneys lead), and according to their statistics, bankruptcies in Utah are down 12% from this time last year. Here is the link to the ABI’s statistics: http://www.abi.org/newsroom/bankruptcy-statistics. According to their chart, we have a 22% drop in overall filings, nationwide. I can’t give you the overall national reasons for this, or official Utah statistics. From my anecdotal experience, everyone I’ve spoken to has seen a decrease in income over the past few years and either can’t afford to file (I know) or are waiting just a little longer to see if things turn around enough so that they won’t have to file. This entry was posted in Utah Bankruptcy on November 30, 2015 by robertspaynelaw. My first question is what is the criteria for deciding which to file, Chapter 13 or 7? This is XXXXXXXX. I haven’t had a moment to call you back as discussed the beginning of the week. 3. your are losing your home to foreclosure and you want to catch up on payments in a chapter 13. Otherwise, a chapter 7 is normally better. This entry was posted in Utah Bankruptcy on November 20, 2015 by robertspaynelaw. 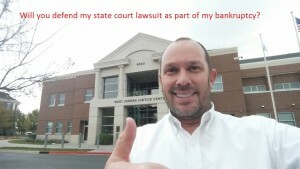 Will you defend my state court lawsuit as part of my bankruptcy? When you retain a bankruptcy attorney, you are hiring an attorney to file a federal bankruptcy for you. As for me, I haven’t been in state court in years, and I wouldn’t even know which table to sit at if I was trying to defend a lawsuit. Honestly, if you are still in the stage of defending yourself in state court, then you’re probably not ready for bankruptcy yet. However, on the day you file bankruptcy, everything else stops. Those state court lawsuits are put on hold by something called the “automatic stay” in bankruptcy, which stays (stops) every other court proceeding. 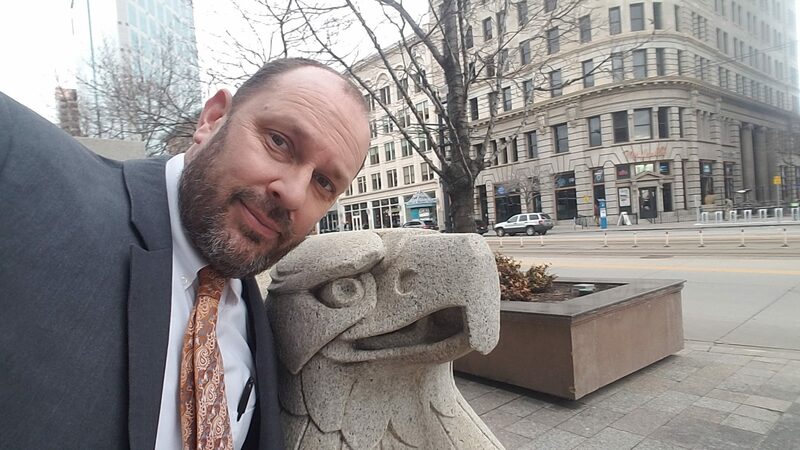 If your creditors want to try to chase you in state court, they have to now file a Motion for Relief from Stay in the federal bankruptcy court, and it is almost never worth their time. So although I won’t go to state court with you as your bankruptcy attorney, neither of us will need to go. Our bankruptcy trumps the other court actions, and you generally only go to one more court appearance, sitting at a table with me and a bankruptcy trustee. This entry was posted in Utah Bankruptcy on November 6, 2015 by robertspaynelaw. 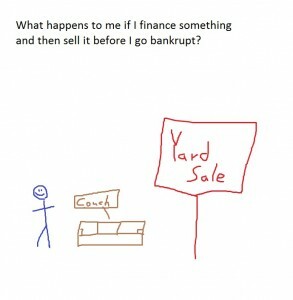 What happens to me if I finance something and then sell it before I go bankrupt? My client buys a couch from R.C. Willey and finances it. He stops making payments because those payments are one of many things that become overwhelming. When is forced to move from his nice home, he sells off the couch as one of many household items he can no longer fit in his new, smaller place. A few months go by, and he files bankruptcy. At the 341 Meeting of Creditors, R.C. Willey shows up and asks what happened to the couch. He tells the truth: he sold it. They usually sigh and walk away. So what usually happens is: nothing. What could happen? 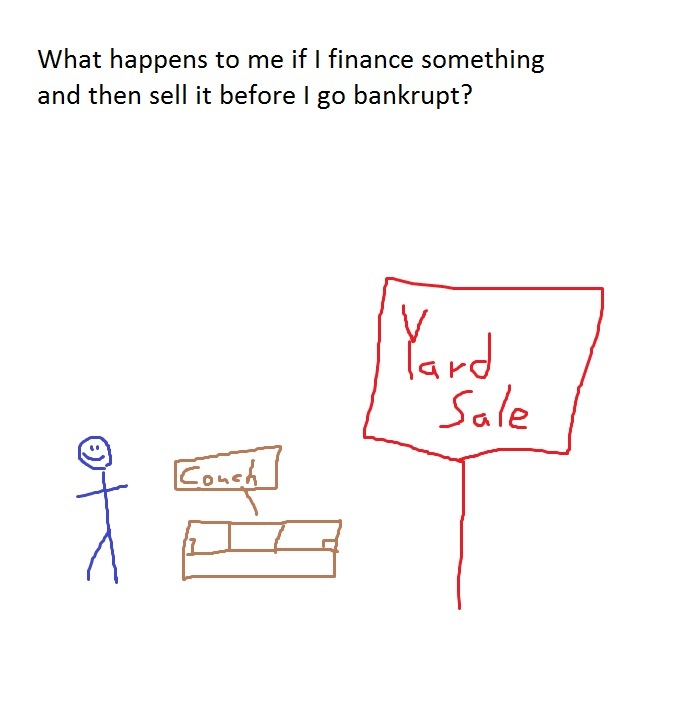 Well, the creditor could object to the discharge of that particular debt because he argues that the purchase and subsequent sale was some kind of bad faith transaction in anticipation of bankruptcy. The creditor could argue that they were defrauded. however, the value of the financed item is usually so low that no creditor goes through the bother. So yes, bad things could happen, but I’ve never seen it with a financed item. 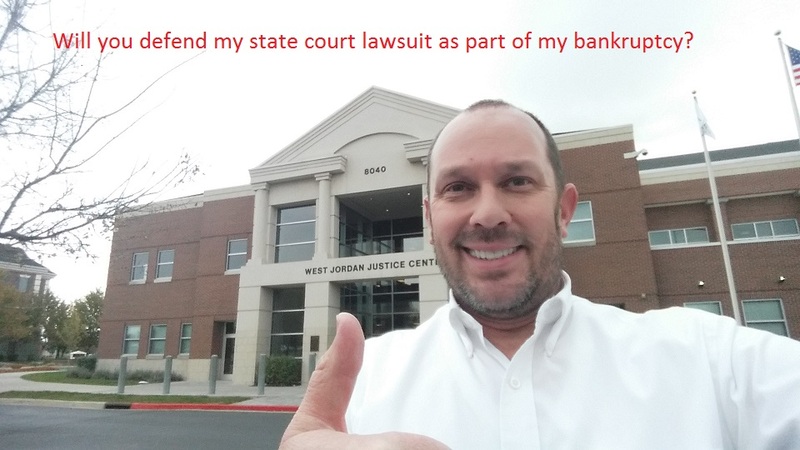 This entry was posted in Utah Bankruptcy on November 3, 2015 by robertspaynelaw.